cWhether it's our all natural ready-to-cook (raw) boneless duck breasts or gourmet flavor marinated duck breasts seasoned with a blend of tasty herbs, Alqamar Farms offers the perfect duck breast product solution for breakfast, lunch or dinner. Versatile preparation options let you sauté, grill, bake, roast or stir-fry to express your reativity. Boneless, hand-trimmed duck breast that's slightly marinated with water and sea salt to ensure the best cooking experience. 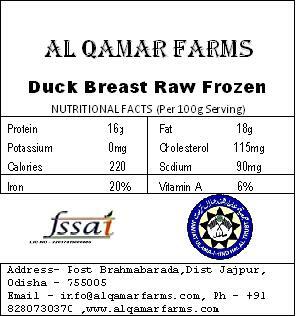 These duck breasts work well in a variety of recipes and cuisines as is or score the skin to aid in rendering out the fat. If frozen, defrost in refrigerator overnight. Preheat oven to 400 degrees F. Preheat sauté pan for 3 minutes on medium heat. Score skin in 1/4" intervals, being careful not to cut into the breast meat. Rotate breast and score again, making a crisscross pattern. Place duck skin side down in sauté pan, cover and cook for 10 minutes. Turn breast over and cook 2 minutes. Transfer duck to a metal baking sheet, skin side up, place in the oven and cook for 13 minutes. Allow portion to rest for 2 minutes. Internal temperature should be 165 degrees F when cooked. Oven and cook times may vary. Boneless Duck Breast, Water, Sea Salt.